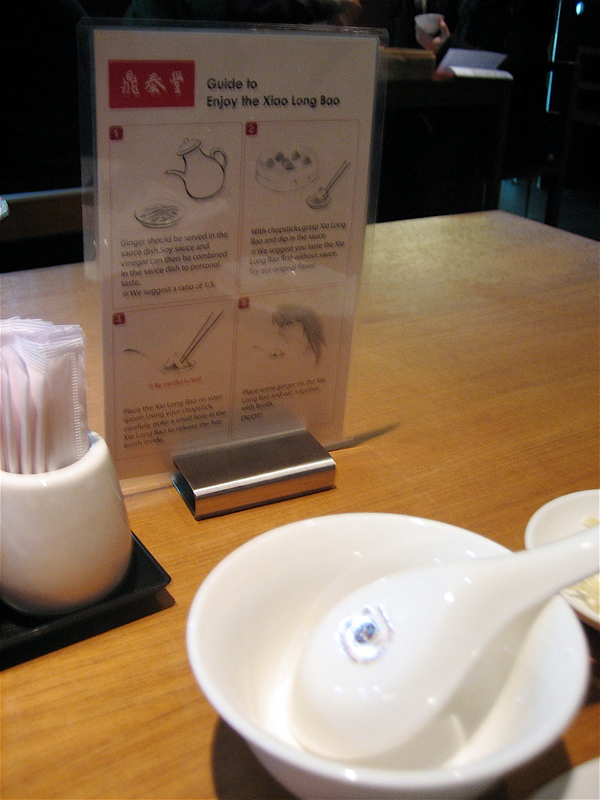 I finally made it to Din Tai Fung! After reading Helen’s review on Grab Your Fork, and Not Quite Nigella’s review, I couldn’t wait to try this place out. We got there super early, straight after work, as we had heard about the queues. We didn’t have to wait long, 3 minutes! That’s less time than it takes Madonna and JT to save the world! 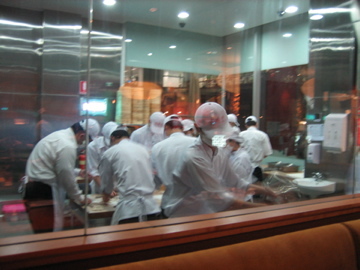 You can see the highlight and the specialty of the restaurant as soon as you walk up: the Dumpling Lab. 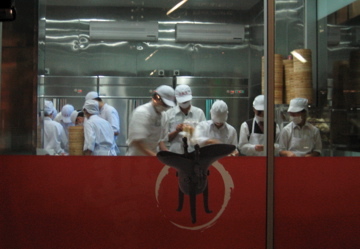 Men and women decked out in white with masks, hats and gloves turning out piles of perfect dumplings. Now, a caveat: I’m not a pork eater. I am, however, a hypocrite. I eat bacon, prosciutto and ham. I have no aversion to these styles of pork at all. I don’t, as a rule, like pork, pork chops, pork steaks, mince pork. So yum cha is always a hassle no matter how much I like it as I never know what I’m putting in my mouth. This often ends in embarrassment when I hastily spit things out. This time, I was determined to try the pork dumplings as they are the house special, and famous around the world. I was a little worried, but then bliss! So yummy. The soup just bursts into your mouth, not overwhelmingly so, but enough to bring a smile to the face. We also ordered vegetarian fried rice, braised beef soup and braised beef soup with noodles, and a vegetarian steam bun, and pork steam buns. Unusually, though using the same soup and the same beef, the non-noodle one had no greens, while the plain one had lot’s of baby spinach. The soup was super tasty with a very fragrant star anise aroma, while the beef was very tender, but quite fatty. The vegetarian steam bun was incredibly fresh, but did require the vinegar/soy/ginger dressing combo to add a bite to it. The Vegetarian fried rice was gorgeous and fluffy and fresh and light. Just gorgeous, and moreish! And then, finally, on to dessert. I have to say, I wasn’t feeling particularly full at this point. This style of food is very light, but keep in mind we didn’t order any real side veggies or tofu or drunken chicken, something we had intended ordering but were told was sold out. While perusing the dessert menu we didn’t realise that one whole page was listed as “Not available” There went my hankering for green tea pudding! Not to worry, sweet dumplings instead! I ordered chocolate ice cream, while my partner in crime ordered the black sesame. Both came garnished with sprigs of mint and red bean, which my friend hastily scraped off. Then, the piece de resistance! Hot red bean dumplings! Now you either love or hate red bean paste. It’s very sweet and has a texture. 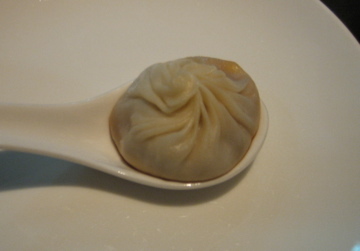 Hot and in dumplings? Fabulous. Though really surprisingly rich. Definitely one to have again. Now a word on the service: Nothing short of quite spectacular. We were personally ushered to our table, and throughout the evening a raft of servers were passing by constantly refilling tea and water, removing baskets, checking off ordered items, and finding out if we wanted more. It really was fantastic without being overbearing. A great balance. Yum! Hey there, I’m a fan of Chinese Noodle House in Quay Street, Haymarket. Dumpling and noodles to die for, plastic grapes on the ceiling giving you that Western China feeling. Also SeaBay at 372 Pitt Street has slighty more elbow room, and great for a hit of Northern Chinese food. Try Spring lamb pancakes, Spicey Chicken salad with cucumber and Sichuan pepper and the eggplant dish. Hi Joanna, I love Seabay! The chicken and cucumber salad is fantastic..I think I like seabay better as there’s a better range of dumplings for non pork eaters!